January was quite the month! One of my friends from college got married the first weekend of the year, so we had a mini-reunion with most of our group at the wedding. It was so great to be able to catch up with everyone, laugh at old stories, stay up too late, and drink too much! I started a new job, which has been kind of stressful (I don't deal well with change!). Everyone at my new office is very nice, but it's a lot to learn - even though it's another law firm, the cases are very different from what I was doing for the last 8 years. One nice thing is that I actually have a real lunch break, so I've been bringing a book and getting so much reading done! We celebrated our niece's third birthday; I took her shopping and even though she's still a little too young to be able to pick stuff out, she found some cute bracelets and I also got her a Mickey and Minnie Mouse t-shirt, which I think she liked! Is anyone else watching The Masked Singer on Fox? If you don't know what it is, it's a reality show/singing competition where celebrities don a mask and costume and the judges try to guess who they are by their voice and some clues. Ok, it's kind of cheesy but also fun, and every Wednesday night, my sister and I watch it together, texting each other back and forth about the judges' terrible guesses. A 5-star review from Suzanne at The Bookish Libra sealed the deal for me on reading The Dream Daughter, which turned out to be a 5-star read for me, too! Thanks, Suzanne! How was your January? What was your first read of the year? Are you still sticking to your New Year's resolutions? Four three two one's cover grabbed me immediately -- what an enticing premise that is! And so emotioanl. YAY for the new job going well, and a long lunch break too! It was a very emotional book! Change can definitely be stressful, I relate! I'm glad you have a good lunch break, though. I hope things smooth out during February and you manage to cope better. Thanks, Amy! It's weird having an hour-long lunch break all to myself - before, it was just half an hour and we ate together, so it wasn't much of a break! Wow, you had a busy month. Congrats on the new job. Hopefully it gets easier as you get used to it. Happy February! That is quite the month!! Yay on new job and getting to read on lucnh break :) I loed The Dream Daughter too!! So good. I am so glad I finally got to The Dream Daughter, it was amazing! What a wonderful month, Angela! I hope the transition goes well with the new job. That’s hard for anybody. I have The Huntress coming up! Thanks, Jennifer! I agree, there's always a learning curve, every office does everything differently! Congrats on the new job! I'm sure you'll pick up on the differences soon -- yay for lunch breaks and reading! My Plane Jane has been on my TBR, but I haven't had a chance to read it yet. Maybe I need a lunch break -- haha. We're weirdly addicted to The Masked Singer! I stumbled across a clip on YouTube the first night, and no we watch it every week! I want to know who the monster is. His voice sounds sooo familiar, but I cannot place it. My husband thinks Gladys Knight is the raven. There's something familiar about the rabbit, but I don't know! It's so crazy! OMG, I am so glad someone else is watching this show! I agree that Gladys Knight is the raven. I have no clue who the monster is and he hasn't been on for awhile. I think the rabbit is Joey Fatone from NSync! You did get a lot of books read! Bet you're glad to have that break in the day to read and relax a bit. Hope your new job learning curve is not too bad. The shopping trip sounded fun! Thanks, Kay! The hour-long lunch break has been really nice! I can get away from my desk for awhile and just chill. Congratulations on your new job! Good for you making some changes. You're very welcome, it was a great post! I'm really curious what you thought of Uncharted because I want to read it but haven't seen very many reviews in the blogosphere for it yet. And glad the new job is going well!! Thanks, Greg! My review for Uncharted is coming up this week! Congrats on your new job, Angela! Hopefully you'll get into a rhythm soon so it won't be so stressful. And yay for The Dream Daughter being a 5 star read for you too! I am so glad I finally read it! Looks like you had a great month for reading! And congratulations on your new job; I hope it goes well for you. It's always a bit stressful as you adjust to a new job, but hopefully that will wear off as you settle in. It's always wonderful to get together with old friends. I'm glad the wedding gave you the opportunity to do so. It's definitely been a lot to adjust to, I was at my last job for 8 years, but I'm hopeful! I'm really glad we all got the chance to get together! Oh well done on getting more reading in at your new job! And congrats on the job itself. Sounds like you've also had a lot of adjustments this year!!! So glad you're well and that you managed to catch up with some old friends. I hope February is a great month for you!!! Thanks, Di! Yes, lots of changes this year! Wow! 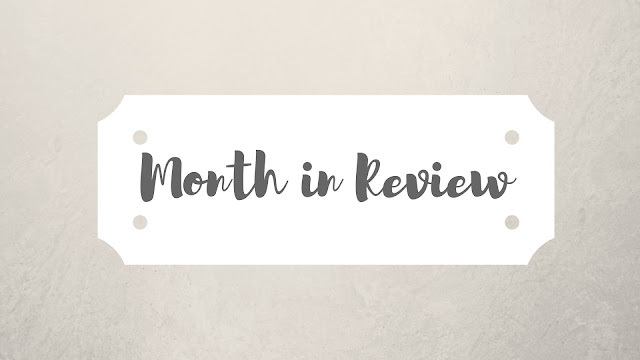 You had a great month! Congrats on the new job. That is awesome you can read during your lunch break - definitely a great way to destress. I look forward to your thoughts on Uncharted! Thanks, Christina! It's so nice to get away from my desk for an hour. The mini reunion sounds fun! I can imagine a new job is stressful, but yay for more reading time! I've been hearing about The Masked Singer but had no idea what it was, so thank you for explaining it lol. I'll have to try and watch it sometime! LOL, you're welcome! It's cheesy, but it's a fun way to pass a Wednesday night! What a great month, Angela!! I can't wait to see what you thought about The Guernsey Literary and Potato Peel Pie Society, it's one of my all time faves! Thanks, Molly! I really enjoyed it! I've been meaning to get to My Plain Jane. The first book was so much fun. That's so much for the shout out. You are too kind and I think you're awesome as well! Thank you, I hope so, too! OMG, being a nurse we never have those. I am glad you are getting some reading done and I hope the job is working our great. You have some amazing books listed here and a lot I would like to read! What Makes You DNF a Book?